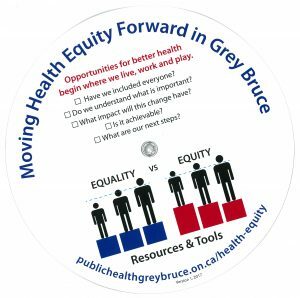 Printing can be interactive as demonstrated by this project recently completed for Grey Bruce Health Services. 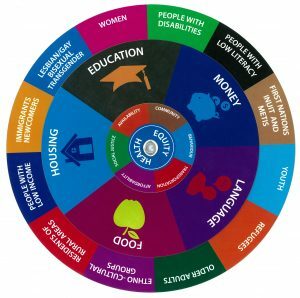 The dial is an interactive tool, allowing users to rotate each of three dials to align specific population groups with challenges and solutions. The customer provided the requirements and we designed and produced the dial. The discs are digitally printed on heavyweight card stock and laser cut into circles. The three layers are attached with a center grommet which allows them rotate independently. The diameter of the outer circle is 10 inches. The backside of the large dial is also printed and contains messages focusing on the differences between equality and equity. This type of rotary dial can be used in games, education and marketing pieces. Contact us if you have a specialty print product to create.